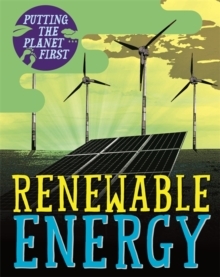 Discover how people all around the world are putting the planet first and helping the environment in new and exciting ways!All sorts of natural power can be harnessed to make energy, from the sun and the tide to wind and waves. In PUTTING THE PLANET FIRST: RENEWABLE ENERGY, discover how people around the world are working all the time to find new ways to create energy without harming the environment or using fossil fuels. Learn too, what you can do to help the environment, and about small changes you can make that will have a real impact. This book is a fascinating introduction to the positive changes people are making to try and live more sustainably, and will inspire children aged 7+ to think creatively about how they can put the planet first!